Replacement Car Keys Grand Rapids MI 7 Days a week! For replacement car keys Grand Rapids MI call RemotesCarKeys. We'll quickly get you a quote and get your car running again. We'll come to you and replace your car key. Usually within an hour or two -- 7 days a week. If you need a quote, have a question, or would like to make an appointment; we are standing by to help out. 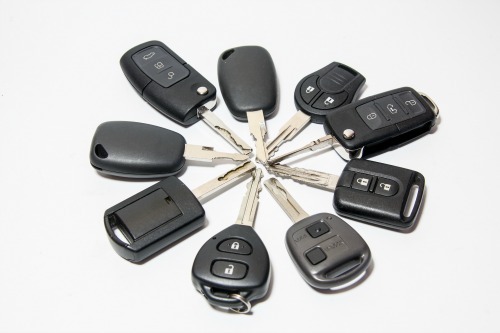 We specialize in replacing, duplicating and repairing car keys. We stock a wide variety of OEM (original equipment manufacturer) approved car keys and remotes for most makes and models on the road today. If for some reason, we don't have your key in stock, usually we can have it the next business day. After the years 1998-2001 most vehicles were equipped with a transponder "chip" key. The chip is embedded in the plastic head of the key and you usually don't even know it's there working, until you lose your key. It's there for security reasons and unless the car recognizes this chip and belonging to the vehicle, they car will not start! Or if it starts, it will turn off within seconds. You will usually see the security /theft light lit up on the dashboard when you attempt to use a key without the required programming. Most car keys today, however, needs some kind of programming! It is the programming process that allows the key to recognized by the vehicles anti-theft system. Without this recognition, they car simply won't start. The key will turn in the ignition and fail to start or start for a few seconds and shut down. This anti-theft system is designed as a foil to thieves that might want to steal your vehicle. Many people believe it is the replacement car key that needs programming, but actually it's the car's computer that needs to recognize the new key. That's why the programming has to be done at the vehicle. If you go to the dealer for a key and it requires programming, you will need to tow the car to the dealer (during dealer hours). Not very convenient--and also an added expense. 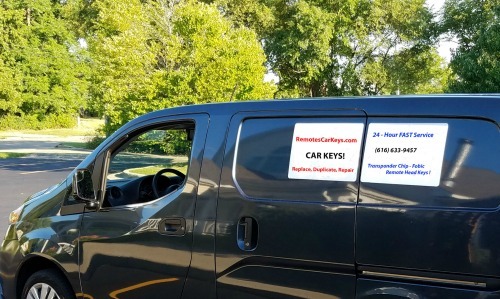 RemoteCarKeys.com is a division of A-1 Locksmith Service. With our fully equipped van, we come to you. Replacement car keys Grand Rapids MI as well as Kentwood, Wyoming, Ada, Comstock Park, Grandville and surrounding area, wherever the vehicle is (in Grand Rapids area). Remotes & Replacement car keys Grand Rapids MI in a hurry. Is a Local Locksmith Service with 1-2 hour turnaround to replace lost car keys! Vehicle Identification Number or VIN (found on registration, insurance certificate or title. License Plate Number and State the Plate is registered. Proof of ownership. Title or registration and photo ID for identification. Location of the vehicle! We are a mobile service and will come to you to for car key replacement. Things to know before you order your key! We use the VIN# (vehicle identification number) of your car to order the key. This means we recreate the key exactly as it came from the factory when you car was built. If for some reason your ignition was replaced, replacement car keys using the VIN# won't work with your car. (Let us know -- we have other ways to get the job done. The vehicle must have sufficient battery power to allow for programming (if necessary). If the car has not been started in the last few days, the power will be depleted and might not be sufficient. Make sure we are aware of this situation when ordering your new key so we can make sure to bring a jump box.